Why be confined to a bedroom in a B&B or hotel when you can have the freedom of a comfortable, self contained studio or apartment? Located on the banks of the River Nevis, which swells with flash floods as snow melts from the mountain top of Ben Nevis, Glenlochy Apartments is a trio of self-catering holiday apartments, ideally situated just a mile and a half from the foot of Ben Nevis, close to the end of the West Highland Way and yet still only a 10 minute walk from the bustling town centre and the railway station. 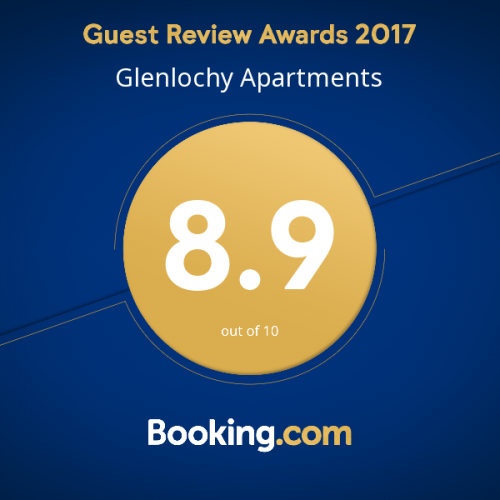 Glenlochy Apartments are fully equipped and available nightly or weekly on a self-catering basis. I am Joanne. I took ownership of the apartments in May 2016 and have since refurbished and refreshed all the apartments. I enjoy the interaction with all guests, albeit via phone and internet and appreciate that this customer focus is such an important aspect of facilitating the arrivals of my guests. A key member of the team is Linda who is there daily preparing the apartments to ensure a comfortable and satisfying night's sleep for any new arrivals. We would be happy to host you at Glenlochy Self Catering Apartments. Very modern clean and stylish apartment with everything you need for a relaxing overnight stay, booking was easy and information regarding the room and keys straight to my phone. What a simple way to do things it takes the hassle out of traveling. We will be back. This was a great place so clean everything you need for a comfortable stay, walking distance of main town centre and for heading out further afield if that?s your intention. Beds were comfy, a little home from home. No problem access or booking for apartments. A fantastic find and will definitely be back and for longer next time. Thanks again you got a great place and it?s done properly. A cosy ground floor studio apartment with double bed and sofa bed.